Should option value count in rail benefit valuation? Now, there are some very good systems in this chart, and yet NYC kicks the cookies out of every body else. 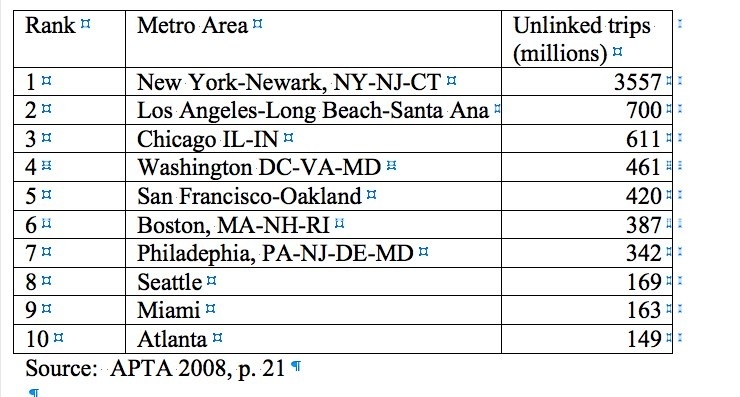 Between 1984 and 2006, transit supply as measured by vehicle miles increased by 35%. Supply of the various rail services increased much more rapidly than bus, with light rail more than tripling. Over the same period transit ridership as measured by unlinked passenger trips increased by 13.5%. This number is often cited as good news for transit. In all cases ridership grew less than service supply, meaning that over the period service productivity declined: unlinked trips per vehicle mile dropped from 2.55 to 2.14, and the share of operating cost covered by fare revenue declined from 39% in 1996 to 33% in 2006. Now some systems, like the DC system, are much higher in fare recoveries, and others lower . c) it’s not clear to me that there have been productivity gains in passenger transport in general (highway, airline, or transit); it may be that rising costs throughout the sector (from land acquisition in particular) caused percentage increases in costs to outstrip percentage patronage gains. Now, part of the reason for increased spending is that regional agencies control more of the planning and programming than they did 30 years ago, and local/regional sources of revenue have also increased. 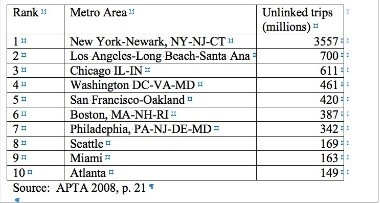 It makes sense that investment in regional systems, like rail transit, goes up under those conditions, even if the spending is less productive than we might hope in terms of overall welfare [3,4]. Nonetheless, the environmental-transit connection has been made convincingly in the democratic imagination if not so much empirically. I suspect that this connection has led, further, to an increase in option value for systems like the HSR and urban rail among those who are unlikely to take it–ever. Ok, now this isn’t option value. This is somebody who would, if other people actually use the transit supplied, enjoy congestion reduction benefits. Those we know how to capture. We have cost estimates for carbon emissions reductions, though they vary widely. But we don’t necessarily have option value, which is trickier, and I think relevant to costing out mega-projects like HSR. So what I am asking here: Is it a legitimate benefit to count people’s willingness to pay for HSR, for example, simply because they want the US to have it “just like Japan and Europe”? It’s a symbolic value rather than a use value. I should be clear about definitions. Option value concerns individual’s willingness to pay for something they may never use, but they like having the option or they like the fact that whatever it is exists. And option value has been calculated and used in economic analysis for a variety of things: one of the notable uses of option value occurred when assessing damages from the Exxon Valdez spill off the coast of Alaska  So one cost occurred through devastated fishing; another through lost tourism revenues; and finally, using contingent valuation, a loss to those of us (like me) who have no intention of going to Alaska but who value intact ecosystems in the abstract. So for rail there would be the direct user benefits/costs, nontraded benefits/costs (emissions, etc), and value placed on option. What do you think? Giuliano, G. and L. Schweitzer. 2009. “Her Money or Her Time: A Look at Contemporary Transportation Policy from a Gendered Perspective.” Forthcoming for the National Academies of Science Transportation Research Board. C. Winston and V. Maheshri. On the social desirability of urban rail transit systems. Journal of Urban Economics, 62(2):362–382, Sept. 2007, doi:10.1016/j.jue.2006.07.002. P. Nelson, A. Baglino, W. Harrington, E. Saﬁrova, and A. Lipman. Transit in washington, DC: current beneﬁts and optimal level of provision. Journal of Urban Economics, 62(2):231–251, Sept. 2007. R. T. Carson, R. C. Mitchell, M. Hanemann, R. J. Kopp, S. Presser, and P. A. Ruud. Contingent valuation and lost passive use: Damages from the Exxon valdez oil spill. Environmental and Resource Economics, 25(3):257–286, 07 2003.